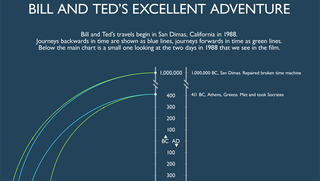 Over on FlipFlopFlyin', Craig Robinson has put together a graphic summarizing all the time travel in Bill and Ted's Excellent Adventure. The film leaves some of the exact dates open to interpretation—did they hang out with Genghis Khan in 1209 or 1269?—but these details are well handled here, and we're comfortable referring to this as the definitive Bill and Ted timeline. The full graphic is below. It might be a little confusing, but believe me, it could be a lot worse.